A drawing of the profile of a clean-shaven man, his head and shoulders turned to the left. He wears a soft cap over long wavy hair. There is a detail of a thigh in the lower right corner. Melzi's 50. The metalpoint was probably always rather faint, for Leonardo strengthened the profile emphatically, detracting from the delicate modelling and the quality of light in the eyes. 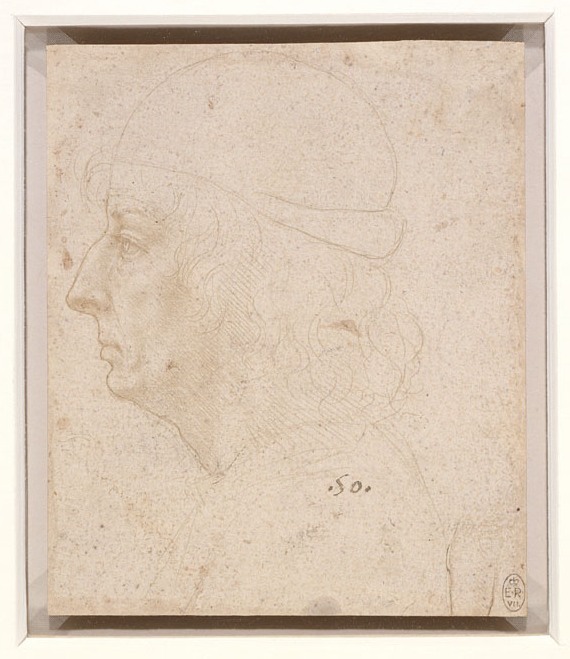 His wish to fix the profile at the expense of the pictorial effect suggests that the drawing was preparatory for some other work, presumably a small (and rather conventional) painting – Leonardo may well have been responsible for more than his three known Milanese portraits. The profile resembles the known likenesses of Galeazzo Maria Sforza, the former Duke of Milan, but he had been assassinated in 1476; a large nose was however a distinctive trait of the Sforza, and the sitter may have been another member of that family.